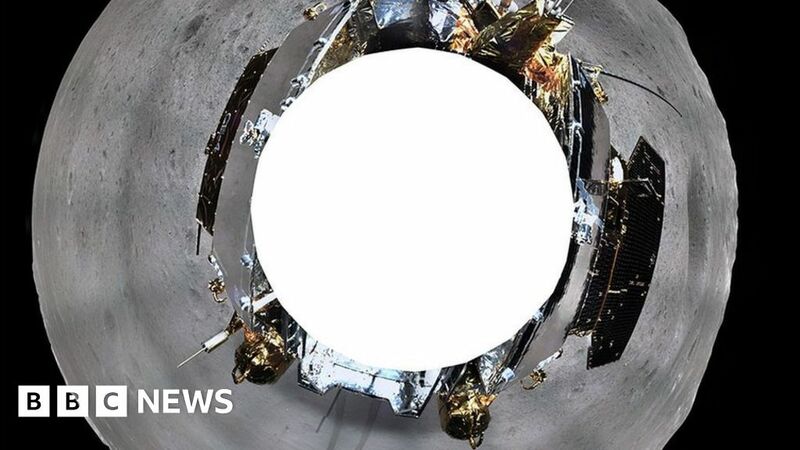 The Chinese space agency has released its first panoramic image of the lunar position where this spacecraft landed. The picture shows parts of the static lander and the rover robot, which is now exploring the landing site at Von Kármán crater on the far side of the Moon. The Chang & # 39; e-4 mission was the first of these attempts to land on the side of the moon that we do not see. The rover has just awakened from a "standby" period. The controllers placed it in this mode shortly after the touchdown as a precaution against high temperatures, as the Sun rose to the highest point above the landing site. Those temperatures would have to reach around 200 ° C. But the Chinese Lunar Exploration Program (CLEP) said that the Yutu rover, its lander and the satellite relay were all in a "stable condition". 9659007] The Chinese state television has also apparently released an image from Yutu 2 of the static lander. In contrast to the previous images from the landing site, the panoramic image was corrected by the color by Chinese researchers to better reflect the colors we would have seen if we were there. Online commentators had pointed out that these earlier unprocessed images made the reddish moon landscape appear – A far cry from the gray powdered gunshot landscapes familiar from other missions to the surface. In an article for The Conversation, Prof. Dave Rothery of Milton Keynes' Open University observed: "In the raw version, the lunar surface appears red because the detectors used were more sensitive to red than blue or green. " Chang & # 39; e-4 was launched from the Xichang satellite launch center in China on December 7th. He touched at 10:26 am Beijing time (02:26 GMT) on January 3rd. This is the first mission to explore the farthest side of the Moon from the surface. Because of a phenomenon called "blockage of the tides", we only see one side of the Moon from the Earth. This is because the Moon takes the time it takes to rotate on its axis, just as it takes to complete an Earth's orbit. The farthest side is more bumpy, with a thicker and older crust that is full of other craters. There are also very few of the "maria" – the dark basaltic "seas" created by lava flows – which are evident on the nearer familiar side. The rover and lander are carrying tools to analyze the geology of the unexplored region. Space News reported that the rover would be put into a dormant state on January 12, coinciding with the lunar night, when temperatures could drop to around -180 ° C.
During this period, the rover would have had limited functions.